Renovation of Coach Barn into Conference Center currently in design. Duke Farms is the magnificent 2700-acre property created by James Buchanan Duke, a prominent industrial entrepreneur of the late 19th and early 20th centuries and benefactor of Duke University. A large portion of the land was assembled and developed by Duke, beginning in 1893, and was added to and cared for by his sole heir and daughter, Doris Duke, throughout her lifetime. Upon her passing in 1993, a philanthropic trust was created from her last will and testament to maintain and transform the property. Doris Duke thought of Duke Farms as a haven for flora and fauna and ultimately wanted it to be enjoyed by the public – and these ideals have inspired and informed our work. VITETTA was the lead planner and designer helping the Doris Duke Charitable Foundation and the Duke Farms Foundation develop and implement an exciting new vision, plan and capital project for the transformation of Duke Farms to a new environmental mission, providing the public with environmental stewardship programs and increased access to the property’s unique cultural landscapes. VITETTA was selected to help the Duke Farms Foundation conceive a new institution from the ground up dedicated to green principles. We began by collaborating with the Foundation to write a master plan for the transformation of the property to meet its new mission and are now working to complete the resulting capital projects. These projects include two LEED NC-certified rehabilitation projects. The first is the LEED-platinum, adaptive reuse and renewal of a monumental farm building, the Farm Barn, as an orientation center and offices for the Foundation. 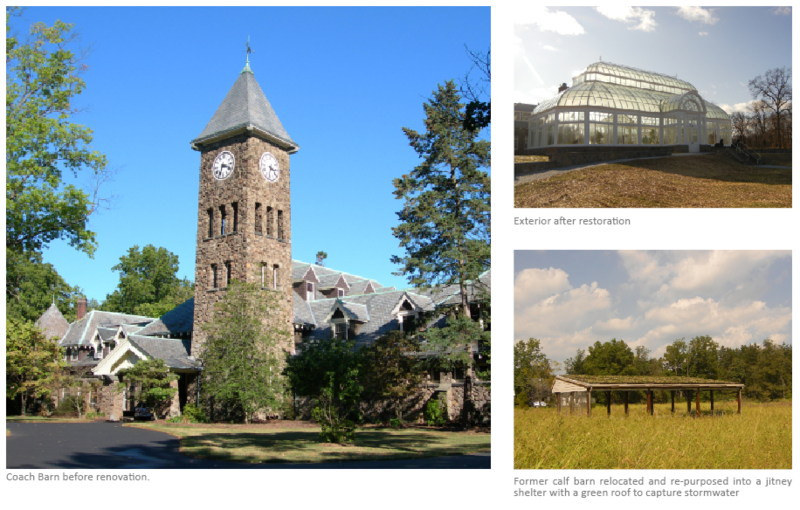 The second is the LEED-gold renovation and renewal of an 1899 Lord & Burnham conservatory structure that will house indoor orchid display gardens and a native plant center. In addition to these two building projects, major infrastructure upgrades are being installed across the 2,700 acre site. These site improvements paired with the building projects embody and demonstrate the green ideals that connect to the property’s mission of being a model of environmental stewardship and inspiring visitors to become informed stewards of the land. Current work includes the design of the renovation of the Coach Barn into a conference facilty for up to 250 people. Our design approach was to embrace notions of simple, elegant, modern, green, light and modest. Other important goals established for the project include that the designs be affordable, replicable by others, durable and constructed of easy to maintain and long-lasting materials and systems and approach being carbon neutral. The designs integrate the buildings with the surrounding landscapes as the landscape is central to the Duke Farms mission and the purpose of the buildings is to enhance, support, and educate about the landscapes of which they are a part and act as a “green beacon” to inspire visitors while providing important demonstrations of sustainable design strategies. Budget management and control has been a major emphasis of our efforts and we worked with the client to hire a Construction Manager (CM) to participate in estimating, logistics and constructability reviews throughout the design process. At the completion of 100% construction documents, the CM’s contract was converted to a guaranteed maximum price, a CM-at-risk arrangement. Adjustments to scope were made frequently throughout the design process based on input from the CM’s team and our own independent cost estimator to keep the documents in line with approved budgets. 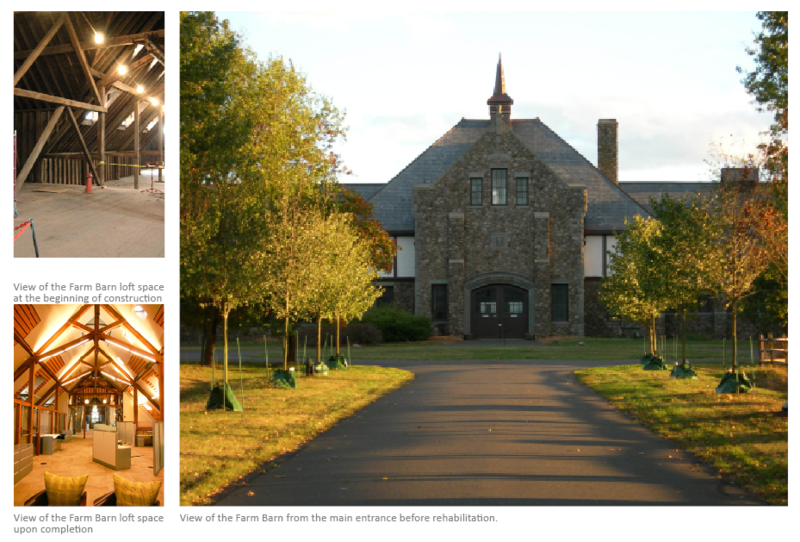 When designing the Farm Barn Orientation Center, we focused on “green” strategies that could be readily replicated and system adaptations that most directly addressed the climate conditions of central New Jersey. Our design achieves a 38% reduction in levels of energy performance below the baseline in the LEED requirement to reduce environmental and economic impacts associated with energy use. At the heart of the mechanical system is over fifty geothermal wells using the earth as a heat exchanger where each watt of energy used to run the heat pump extracts three watts of heat energy from the earth. The historic building’s envelope will be super-insulated, while still allowing important areas of existing stonework to be exposed in the public areas on the first floor. The current single pane glazing assemblies will be replaced with high performance insulated glazing. Energy efficient lighting combined with occupancy and daylight dimming sensors, light shelves, and solar tubes will aid the energy reduction strategies. Rainwater will be captured from the roof in a cistern and will be used as gray water for flushing toilets. Bioswales and rain gardens with native wetland plants will aid in the removal of total suspended solids from motor vehicle runoff, improve groundwater recharge and reduce discharge into Duke’s brook. A constructed wetlands waste water treatment septic system will fully clean tertiary water and discharge it back into groundwater on the site allowing for 100% recapture. Native plants will be used throughout the landscape, eliminating the need for irrigation. The Lord & Burnham Conservatory will house Display Gardens highlighting Orchids and a Southeast Coastal Plain Habitat. Experientially, it is the midpoint of the self-directed journey for the public and will provide a contemplative resting and learning place for visitors. The conservatory’s indoor display gardens within will play an important role in connecting the new mission to the legacy of Doris Duke’s Indoor Display Gardens, which have been decommissioned. The Southeast Coastal Plain Habitat will relate to the project’s environmental mission and the latter will be a presentation of Doris Duke’s stunning orchid collection and contributions to the world of horticulture. A variety of “green” features will qualify the building for its LEED gold certification, including: achieving 28% reduction in levels of energy performance beyond the baseline in the prerequisite standard to reduce environmental and economic impacts associated with energy use – a significant accomplishment for a building envelope that is essentially a single pane of glass thick as required for plant health. The heating system uses condensing boilers and energy efficient radiant floor heating and radiators for the two display gardens and two support ranges; the remaining support ranges will have their heating systems decommissioned (turned off) and become cold houses used to propagate native plants. The Coach Barn originally held the stables for horses as well as “Baby” Doris Duke’s camel in the southern wing of the building. The center section was the garage and carriage wash for the carriages and automobiles. The north wing served as storage and the office for the farm staff. A second floor held the hay storage and an apartment for the farm manager. The front of the Coach Barn is accented with a port cochere and clock tower. Due to the substantial visitorship of the property, the Duke Farms Foundation has decided to further implement the Master Plan by creating a conference center in the Coach Barn. The conference center will allow both local and national groups to meet and discuss current and future environmental issues. The Coach Barn is being designed to accommodate groups of up to 250 people with additional spaces for smaller discussion groups. Catering facilities will be provided to allow for dinner and evening functions.